Over the last few years there has been a long debate on the exploitation of low frequencies in seismic exploration. Their value being undisputable, especially in the case of deep target exploration, how is it that they have always been troubling to those involved in the quest for information hidden inside active seismic signals? People involved in seismic exploration have long been trying to record and exploit low frequencies. However, both the delicate nature of low frequencies, which makes them easily contaminated by noise, and the fact that their production and recording may dramatically increase the cost of a seismic survey, have limited their use to frequencies above approximately 10Hz. Producing low frequencies in seismic can be a nightmare. Explosive sources are known to produce a relatively broad bandwidth signal. However, the relationship between the frequency content of the produced signal and the parameters of the explosion (such as type of explosive, charge, depth) is not very clear, mostly relying on rules of thumb and field experience. Moreover, even in cases where low frequencies are successfully emitted, they tend to be mainly concentrated in the surface noise (ground-roll) and are missing from the reflected signal. As for vibrators, even though the emitted energy and the bandwidth are both controlled, the generation of very low frequencies is usually avoided, as it can result in severe structural damages. Recording low frequencies can also be a hard task. Commonly used seismic equipment is not designed to sense very low frequencies, since that would result in a substantial increase in costs, while the benefit to the survey of the acquisition of low frequencies would be highly questionable, as they are usually the first to be attenuated by high-velocity layers or contaminated with noise and might be easily lost. 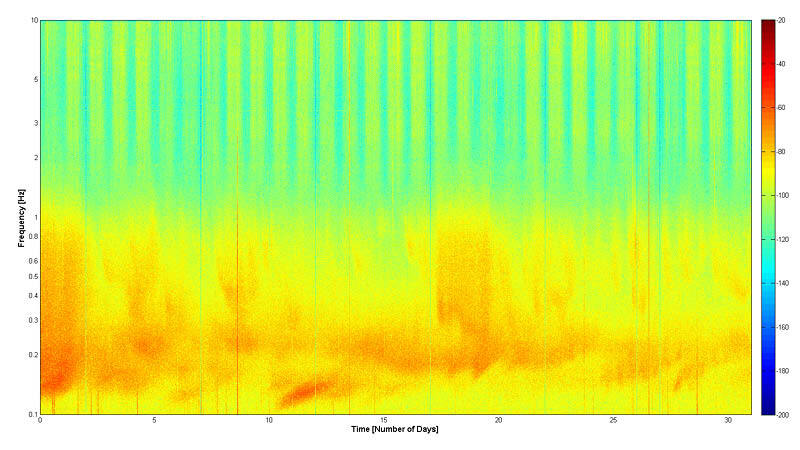 Spectrogram visualising the temporal variation of the frequency content of the signal recorded by a broadband station during a 30-day period. The lowfrequency energy is clearly observed below 1Hz. Image source: Seismotech. On the other hand, passive seismic has for a long time exploited low frequencies (below 15Hz) for exploration purposes. These frequencies exist in abundance in nature, for example in the frequency content of earthquakes and seismic noise. Various passive seismic methodologies, exploiting different parts of a passive seismic signal, have been developed to extract information hidden in the frequency range of 0.1Hz up to 15Hz. So why are we struggling to produce these frequencies ourselves when low-frequency passive seismic signals are constantly travelling through every spot of the earth’s subsurface? The challenge is rather how to record them and extract the information they carry in the subsurface. And while this could be extremely difficult in the case of an active seismic survey, consider how much easier it would be in a scenario where the low-frequency ‘source’ lies below the target zone and one-way travel is all that is needed in order for it to be recorded at a seismic station. A passive seismic network (480 shortperiod stations) installed in an area where a 2D active seismic survey is taking place. Image source: Seismotech. In order to acquire passive seismic, one has to install a passive seismic network, which consists of a number of standalone three-component stations, spread across the area of interest. These stations can be equipped with broadband or short-period sensors, or even simple geophone nodes, depending on the scope of work. Experience shows that for oil and gas applications, the most cost-efficient option is to use short-period equipment, which has the capacity to record lower frequencies at the geophones, for approximately the same cost. These stand-alone stations will record for a specified period of time, like a few months, and the continuous record acquired is the passive seismic dataset, containing all types of passive seismic signal such as ambient noise and local or distant earthquakes. All of which exploit different parts of the acquired signal and thus different frequency bands, can therefore be applied, using a single dataset. This diverse dataset is then analysed and the ‘useful’ signal, as defined by each methodology, is isolated and extracted from the continuous records. 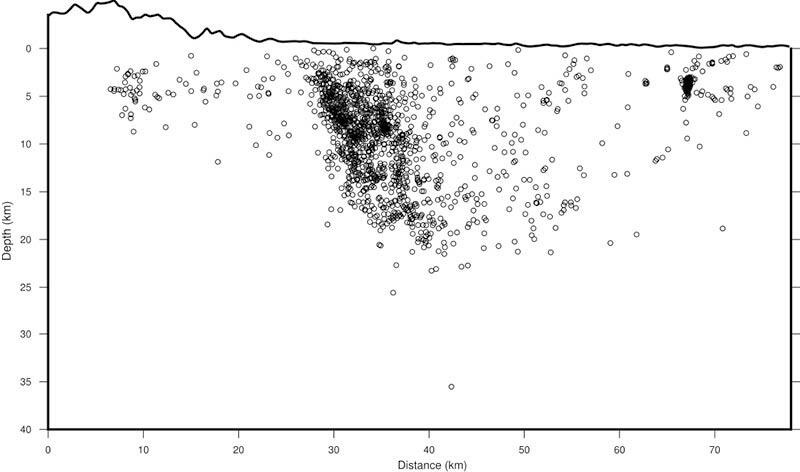 Spatial distribution of the local seismicity recorded during a 6-month passive seismic survey. Image source: Seismotech. In the case of Local Earthquake Tomography, local earthquakes of low magnitude, occurring during the recording period within or around the area of interest, are the passive seismic ‘sources’. These are detected in the continuous records; the first arrivals both of P- and S-waves at each station are picked up and the events’ location and time of origin are estimated, using sophisticated analytical tools like Seismotech’s EQLab. Once the ‘sources’ have been located in both space and time, traveltimes to the seismic stations are inverted, in order to obtain the P- and S-wave velocity distributions below the study area. These models usually extend from the surface to the maximum depth of local seismicity (usually deeper than 15 km), which – in most cases– lie far below the average exploration target zone. However, this methodology strongly depends on the spatial distribution of local seismicity, which might not be uniform or adequate to provide a satisfactory coverage of the totality of the area of interest. This is the reason why alternative passive seismic methodologies, independent of this parameter, are employed to complement the acquired information. Surface-wave energy clearly emerges from the cross-correlations calculated in the context of an Ambient Noise Tomography survey. Image source: Seismotech. Ambient Noise Tomography exploits the frequency content of pure ambient seismic noise. In this case, therefore, there is no need to extract any part of the signal and the totality of the continuous records are used to calculate cross-correlations between station pairs. After frequency-time analysis, the mean Rayleigh-wave group and phase velocities are measured as a function of period, and dispersion curves are estimated for each cross-correlation. Inversion of these dispersion curves results in the construction of 2D group and phase velocity models, and consequently leads to the estimation of local group and phase dispersion curves. These are then jointly inverted to estimate a 3D S-wave velocity distribution below the area of interest, from the surface to a depth defined by the highest period (i.e. lowest frequency) recorded. Surface-wave Tomography, by contrast, exploits distant earthquakes, evidence of which is extracted from the continuous records. A multi-channel cross-correlation technique is applied and phase velocity measurements are performed at various periods. These measurements are inverted and 2D phase velocity models for each period are constructed. Inversion of the local dispersion curves, calculated by the phase velocity models, results in a pseudo-3D shear-wave velocity distribution below the area of interest. Since this methodology exploits the lowest part of the passive seismic signal’s frequency content (i.e. 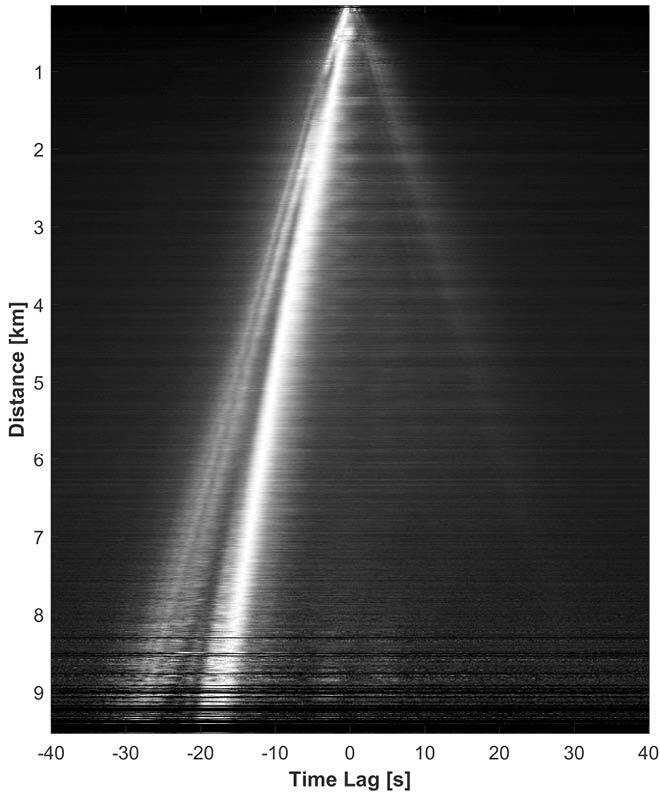 frequencies below 1Hz), the calculated model illuminates the deepest parts of the investigated space. Why Choose Passive Seismic for Exploration? Passive seismic provides an excellent exploration solution that could ideally complement any active seismic survey. It can be run simultaneously with a conventional survey, by setting up a passive seismic network in the area of interest, and, since the fieldwork involved is quite simple, it would not significantly affect the cost of the exploration programme. Implementation of a passive seismic survey requires the installation of a number of seismic stations, which will be continuously recording during the acquisition period. Access to the station points is facilitated by the stand-alone concept, while the only action that has to be taken is periodic data gathering and battery changes at each station. Moreover, the absence of active sources, such as heavy vibrators and/or explosives, from the passive seismic procedure makes it ideal for environmentally sensitive areas, requiring minimum HSE control and leaving no environmental footprint. In addition to all this, the velocity models acquired can provide an image of the subsurface, undoubtedly coarser, but significantly deeper, than that provided by active seismic, due to the nature of the low frequencies exploited. The passive seismic ‘sources’ lie within or below the target zone and the associated one-way travel-paths minimise the loss of energy, making it easy for the low-frequency seismic signal to reach the surface and be recorded by the seismic stations. This is very important, especially in areas where the existence of high-velocity areas close to the surface mask the image below (e.g. complex geotectonic regimes, such as thrust-belt zones), which is often the case in land seismic surveys. P-wave velocity distribution along the 2D profiles of an active land seismic survey. The vertical cross-sections are extracted from the 3D velocity model that was calculated using passive seismic methodologies. Image source: Seismotech. Moreover, the coarse models acquired by passive seismic methodologies can provide a robust 3D model that can be used to process or reprocess active seismic data. These models, apart from being better than a 1D velocity model based on geological information on the study area, might prove to be particularly valuable in cases where little information is available, such as the deeper parts of a survey area where well data are usually either unavailable or extremely sparse. Last, but not least, the shear-wave velocity information acquired by passive seismic provides an additional insight into the explored subsurface volume, permitting the extraction of valuable lithological information from the recorded seismic signal. Passive seismic has long been considered by the oil and gas industry as a methodology mainly applied during the production phase, in the form of microseismic monitoring, leaving its exploration potential on the edges of the industry’s exploration methodologies’ toolbox. However, during the last few years, more and more people have been discovering the value of applying passive seismic for exploration purposes. Successful case studies worldwide and intense scientific testing have changed the view of the oil and gas community on passive seismic. Even though launching a passive seismic survey in parallel with land active seismic surveys is not yet common practice, this might well be the road ahead, as passive seismic can undoubtedly complement the seismic information acquired in a robust and cost-effective manner. Part I: A simple guide to the parameters involved in seismic depth conversion - a complex but important subject in geophysical seismic processing.